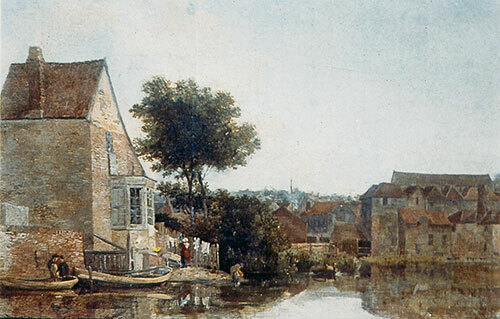 In the 12th century Hauteyn gave two mills under one roof to Heigham. They were called Westwick Appleyard and Bumpstede, one was owned by the Abbot of St. Benet's and the other by the Prior of Norwich. They were built on a cut in the river known as Soke Dyke, west of what later became the City Station, which was effectively built on an island in the river. Frontage to this cut, known as the Old River was mentioned in the sale documents of Heigham Bark Smockmill that worked in the tannery alongside the river. The cut was later filled in, the northern sectioon when the City Station was built and the southern section later, when the roundabout was built. 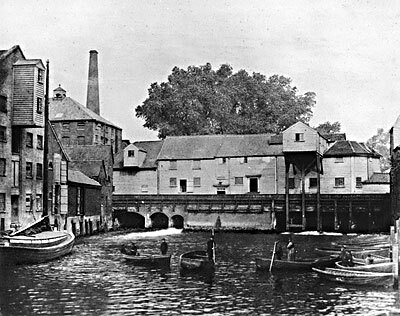 Another pair of mills were called Caulke Mills and they were sited on another cut opposite Appleyard and Bumpstede mills. Blomefield's 1808 History of Norfolk states that Caulke Mills were in existence at the time of the Norman Conquest. A lane called Water Lane leads off the west side of St Martin's Street and on down to the river. 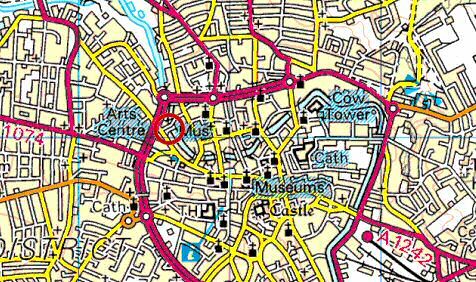 The lane used to be called Mill Lane and it originally led to the Caulke Mills. The centre cut was left clear. 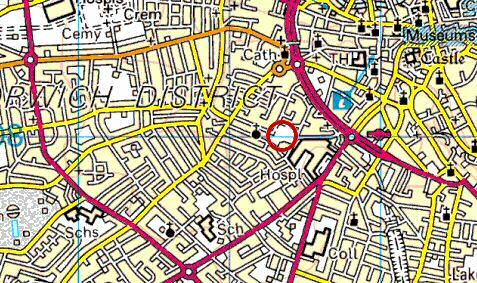 There was probably also a mill near the Dolphin footbridge and another close to the Gibralter Gardens pub. There also used to be a fulling mill set over a stream at Fuller's Hole, some quarter of a mile from New Mills, which was in use during the 1600s. A fulling mill was still in operation in the 1800s although the location could have changed. The building of New Mills was funded by the mayor and other wealthy citizens such as Robert Baxter in 1430, on the site of even more ancient mills at a cost of £211 5s 7d. The bequest of a coronet to Norwich by the late King Henry V provided 200 marks towards the costs. The actual builders or carpenters were William Cok and John Arnold, who were paid 100 marks. At this time, in the reign of Henry Vl, the city of Norwich had been without corn mills for some 12 years. New Mills was set up to evade the costly milling that was provided by the Abbot of St. Benet's in the Home. 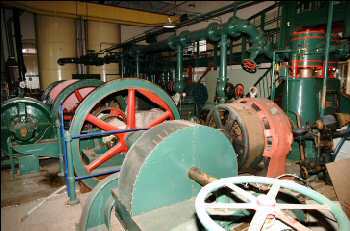 The mills provided good value as well as good service to the city - out of £128 paid annually to the exchequer, £26 came from the mills. Formerly all the city bakers were obliged to grind here and the miller, as a public servant, had a livery and badge given to him every year. The mills are still the property of the city (1869) and in 1706 were let, with the bakers' grant hereto, for a term of 87 years, at the yearly rent of £200, but reduced in 1798 to £180. The mills are now let to Mr. Wells and produce a large quantity of flour weekly. Yesterday Morning early John_Wooton, millwright, aged 66, belonging to the Water-works at the New Mills hanged himself. 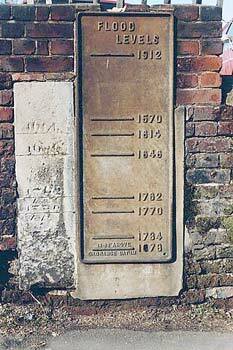 - And the same Day Jos._Hutchin, Millwright, in St. Augustine's aged 63, drowned himself in the river near Heigham. - The Coroner's Inquest found the both Non Compos Mentis. Thomas Kett twice married Gurneys, neither of whom were daughters of Bartlett Gurney, (joint proprietor) who although also twice married, died sin prole on 24th February 1803. Thomas' first marriage was to Lucy Gurney, daughter of John Gurney and Anne Kendall on 29th July 1776, at Norwich. Lucy was a first cousin of Bartlett and died on 4th December 1776. The second marriage at Norwich, on 2nd May 1780, was to Hannah Gurney, daughter of Samuel Gurney and Sally Lawrence. Hannah was a second cousin of Bartlett Gurney. Both women were cousins of Elizabeth Fry (née Gurney) the Quaker prison reformer. Lucy being a 2nd cousin 1x removed and Hannah being a 1st. cousin 1x removed. Just imported, a Cargo of French Bur-Stones and Plaister, of exceeding good Quality, to be sold very cheap for ready Money, by applying to Thomas Craske, at the Sign of the New-Mills, Norwich. A correspondent is of opinion, that if the Court of Guardians for the poor of this city were to contract for the flour and meal at the New Mills, (the delivery to the bakers, being then made under certain regulations) instead of paying 3d per comb commission for buying corn in the market, and so much for grinding it at several wind-mills, there would be a saving of between two and three hundred pounds yearly. On Saturday last Obadiah Oaksford and Jonathan Goss, were committed to the city gaol, by John Gay, Esq., charged with stealing a quantity of iron bolts from the New Mills, in this city, the property of the proprietors. In 1441, eleven years after New Mills was built, John the Abbot of St. Benet's in the Holm, encouraged by ex Mayor Thomas Wetherby, Alderman of the Connisford ward, decided to raise an objection to the New Mills, the dispute being known as Wetherby's Contention. This eventually ended in a riot known as Gladman's Insurrection on 10th March 1442 that caused the destruction of the 4 old mills just upstream. After several years of neglect, the mills on the present site were restored and utilised as a means of water supply. In 1710 the mills were rebuilt, 60% of the flow being harnessed for grinding corn and the remainder for pumping water. By the 1780s New Mills was involved in 3 separate enterprises under the same roof - milling flour, milling wood and pumping water. The wood mill appears to have been used solely for rasping woods such as redwood, fustick and peachwood for use by dyers. In the late 1800s the adjoining silk mill had use of one of the wheels, having presumably taken over from the wood mill. 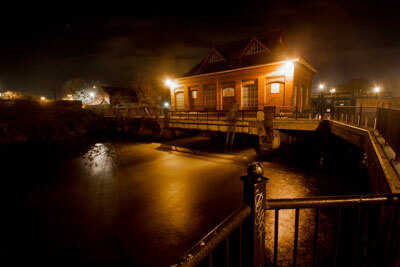 During its history the complex housed flour mills, a fulling mill, a saw mill, a silk mill and the City waterworks. 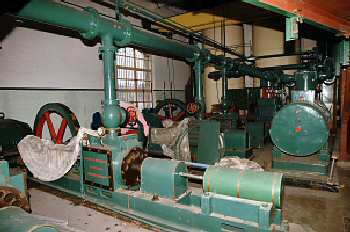 For the majority of the time two waterwheels were in use at opposite ends of the mill main structure, powering a variety of processes. 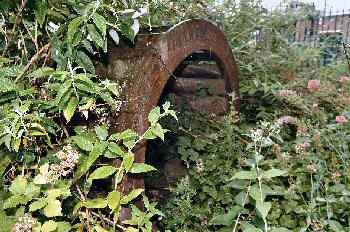 In 1836 the waterwheel working the seven water pumps was 15 feet wide and 18 feet in diameter. 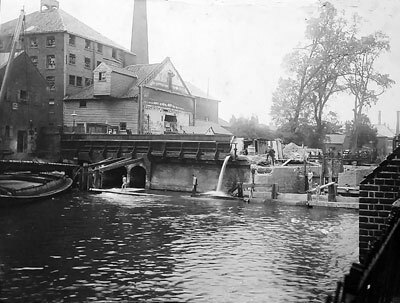 The Waterworks on the River Wensum, by which the City is amply supplied with the pure beverage of nature are the property of the corporation, but are let on lease together with the NEW MILLS -- the lessees being bound to supply the inhabitants according to a table of charges fixed by the corporation a committee of whom is appointed yearly, to inspect the works and control the lessees. 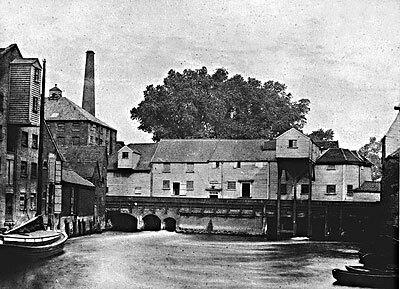 The New Mills were first built by the city, in 1430 and for several centuries all the City bakers were obliged to grind their corn there, but the Abbott of St. Benet's at Holm considered his property injured by these mills, persecuted the city and the dispute ended in a riot in 1441, when the flood gates were pulled up and destroyed. 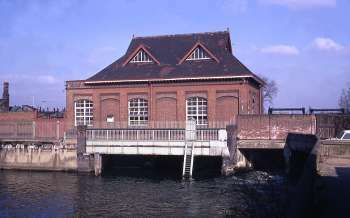 The New Mills and waterworks were rebuilt in 1710. Water was conveyed from thence in the reign of Elizabeth to the Guildhall and the Cross in the Market Place but the general supply of the inhabitants was not attempted until 1697. The works were greatly improved and extended between the years 1790 and 1800. 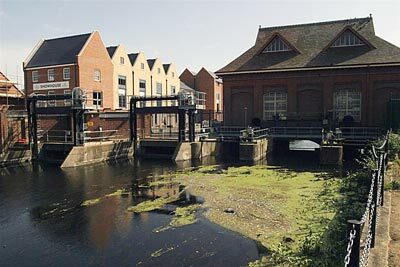 The water is not taken immediately at the mill dam as that is apt to be turbid, but is brought in a trunk or canal from Fuller's Hole, above the dye houses nearly a quarter of a mile from the mills. Part of this trunk passes under the dam and the water is raised by a water wheel 15 feet broad and 18 feet in diameter working seven forcing pumps, three of which drive about five barrels per minute to the reservoir and tower at Chaple Field, and the other four force about four barrels per minute to the Obelisk at Tombland. The latter rises 80 feet, and has a cistern at the top which supplies the higher part of that division of the city. The capacious Reservoir at Chapelfield was cut in 1798 and forms a basin three hundred yards in circumference, banked up with earth dug from its centre to a height of 120 feet above the surface of the river. On its north side stands a Tower containing upright pipes into which the water is forced gaining by this means an ascent of 145 feet from the fountain head - an altitude which is necessary for the supply of the most elevated parts of the City in and near Ber Street, but the Castle and City Gaol are supplied with spring water pumped by tread wheels. Sanitary conditions in the city were dire by 1850. Government Inspector William Lee wrote of the Chapelfield Reservoir ...there were bubbles of gas seen rising in the reservoir, and the water became a dark colour when a supply was let in by the pipes. Also in Hindes Yard slugs were drawn in the water. It was also reported that women would run across Fye Bridge with raps over their noses to avoid the stench. A report of October 1893 by City Engineer J. Buchan states that the city had a population of 104,000 living in 23,111 houses but there were only 4,100 water closets between them. Thus the remainder were provided with that filthy abomination known as a midden closet or with privy pans. The chimney on the left was attached to the boiler house that supplied additional power to the corn and silk mills via a steam engine. Only enough water for the engines today. Drawd it down quite low tonight for Mr. Dawson to depthen his bathing decks. Witham (lived at the mills) should have shut down the gates at one this morning... but it was near five and then I was forced to call him so we could draw off the engines til near nine o'clock and then could hardly get water for them all day. Flooded today. Drawed all the gates. Flour mill not working. Geers repaired. New gudgeons fitted to the flour dressing shaft. A correspondent is of onion, that if the Court of Guardians for the poor of this city were to contract for the flour and meal at the New Mills, (the delivery to the bakers, being then made under certain regulations) instead of paying 3d per comb commission for buying corn in the market, and so much for grinding it at several wind-mills, there would be a saving of between two and three hundred pounds yearly. In 1786 William Youell reported that William Fox went into the country to look for bent oak for the wood mill. Later he bought bent oak from Carrow Abbey. The wood mill made less profit than the flour mill but was not subject to the same sharp fluctations. The corn mill suffered from the problems of millilot and must. The water works provided the most steady source of profit. In the winter people skated with shinbones of animals lashed to their feet, probably on the frozen ozier grounds and marshes on the meadows next to the mills. Youths propelled themselves about the ice with iron shod poles. Tenders sought for erecting new water corn mill. In 1896 Sharpin & Sons were running the mills. 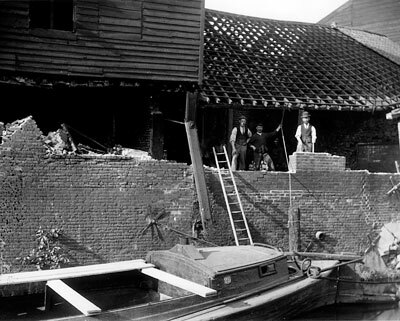 The wherries are moored beside a builders' merchant's warehouse and a corn merchant's warehouse with the lucum is beyond that. 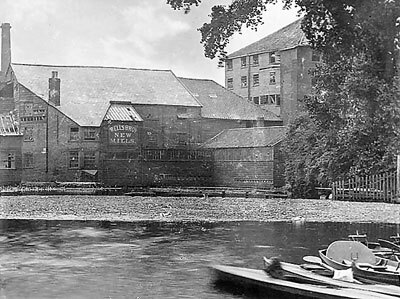 In 1897 the original weathboarded mill was completely dismantled and New Mills were rebuilt again by the Norwich Corporation to be used as part of the City sewerage system. 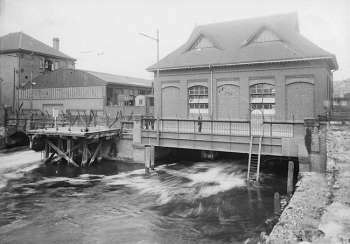 The mill became an air compressing station that worked eight automatic sewage ejector stations. There were five air compressors, three of which were permanently powered by electric motors, the remaining two being normally driven by turbines worked by the river with a total of 100bhp. The workshop annex was built in 1936 to house a further air receiver. The original purpose of New Mills air compressor station was to produce compressed air for moving sewage. This was achieved by holding sewage in 500 gallon tanks called 'Shone Stations.' Inside these tanks were bell floats that lifted as sewage entered and compressed air from New Mills was then injected at 30psi to force the sewage to a higher point that enabled it to free run out to the Trowse works. 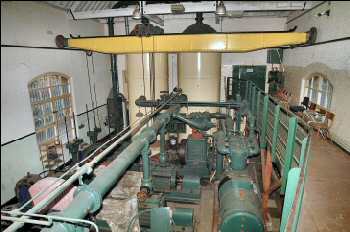 The two Shone Ejector pumps were the last working in the country apart from the pair under the Houses of Parliament. 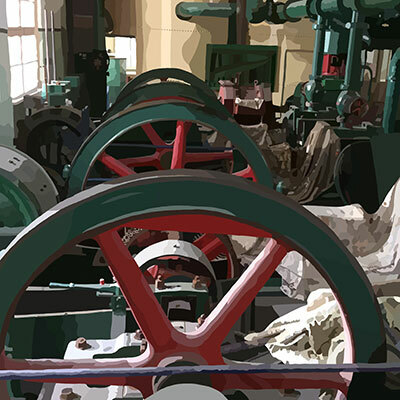 The New Mills compressor was originally driven by cross flow water turbines and steam cylinders. The steam was raised in a steam boiler outside the building, which was fuelled by burning city refuse. On the introduction of electricity, DC power was used instead. Eventually both AC and DC power was used, with DC power being supplied by a rotary converter. 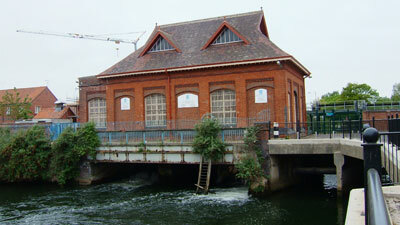 New Mills pumping station closed in 1972 when the new works at Whitlingham came on stream. 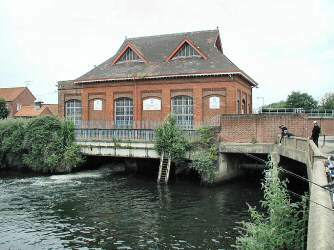 The computer operated sluice gates at the mill are there to control the city drinking water supply, which is stored at Taverham and Costessey. In the 1990s over £20,000 was ploughed into the restoration of the New Mills pumping station in a bid to turn it into a tourist attraction. But it appears the project closed, as the Friends of New Mills Group, which had been working with YMCA Services Ltd. to raise £50,000 was wound up. The artefacts, destined for the museum, were transferred to the Collectors' World museum in Downham Market. 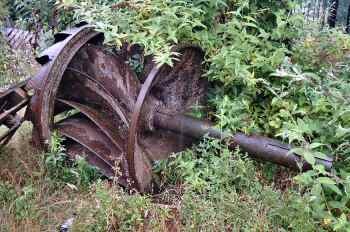 However, as of 2003 the machinery remains intact and in situ. 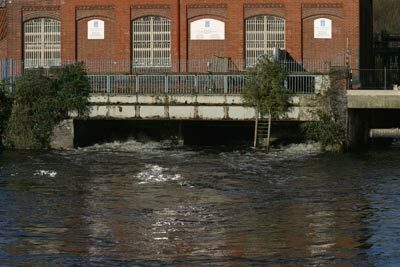 George Sorocold of Derby, who took over the mill in partnership with Richard Barry in 1694, was an eminent water engineer. He was also involved with waterworks in Gt. Yarmouth, Portsmouth and Leeds. Thomas Kett, John Morse and Nathaniel Roe along with their solicitor Mr. Bygrave attended a Court of Mayoralty and signified they would resign possession that evening. A letter from Bygrave to the Corporation included an inventory sectioned In the Flour Mill, In the Wood Mill, exclusive of the water wheel, main cog wheel and water wheel axes. In the Millwright's shop and In the Yard (one old boat fixed on posts for a cart lodge). On Friday morning as Mr James Douglas, brick-layer was near the New Mills in a boat, he lost his purchase in attempting to near the side of the river, fell overboard, and was drowned. William Harrison Wells & Wells Bros also worked the tower mill at Crook's Place, Norwich. William Harrison Wells was formerly at Dilham mill and was a friend of Edmund Girling jnr (1796-1871), who along with William Stannard jnr, ran a London corn and flour merchant company trading under the name of Girling & Stannard. They operated from Jack's Coffee House in Mark Lane, London. When Harrison was running Dilham mill he was occasionally visited by Girling, who was also an artist of the Norwich School and painted at least two watercolours of Dilham watermill. 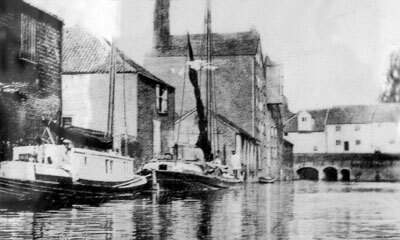 William Harrison moved to Norwich between 1851 and 1854 and by 1864 was running New Mills. When Girling died in 1871 he bequeathed William Harrison £300 in his will, which gives Harrison's address as New Mills and St George's. Potter Batson was the miller at Mile_Cross_postmill from 1868 to 1872. He was born c.1825 in Hellesdon and in 1861 was given as living in Aylsham Road with his parents. It appears that Potter Batson left Mile_Cross at Michaelmas 1872, and went to work for W. H. Wells at New Mills, where his career there ended abruptly. MAIZE MEAL 1s. 1d. per stone; Barley Meal 1s. 2d. per stone; Bean Meal, Split & Crushed Oats 1s. 3d. per stone at New_Mills and Crook's Place Mill, Norwich. E. K. HARVEY, and J. M. VENNING, Esqs., and Dr. BATEMAN. Potter Batson, miller, of Lower Westwick-street, Heigham, was charged with stealing a bag containing 3st. 6oz. of flour, value 10s., the property of Messrs. Wells. – Mr. Sparrow prosecuted; Mr. Linay defended. – Detectives Mason and Wigley were upon the premises of Messrs. Wells on Wednesday evening. They were posted in a stable opposite the entrance of the mill, when they saw Batson come out of the mill, walk round the yard, pass the stable door where the officers were standing, and look out into the river. he returned into the mill, and came out again almost directly afterwards, bringing with him a sack containing something, which he placed by the side of a hay-stack, opposite which the officers were standing, and then returned to the mill. When he came out again, he went to the waterside, where he remained a few minutes; after which he went and took up the sack, and came into the stable where the detectives were. Mason caught hold of him, and asked him what it was he had upon his shoulder, and received a reply that it was some feed for his horse. Mason asked him whether he was the horseman, and he replied in the negative. The officer then took him into custody, and charged him with stealing the bag and its contents. The bag was subsequently examined, and found to contain 3st. 6oz of flour. – On the application of Mr. Sparrow the case was remanded till Monday next. Potter Batson, miller, Albert-street, Heigham, was brought up on remand on the charge of stealing a quantity of flour, the property of his employers, Messrs. Wells of the New Mills. – Mr. Brown (from the office of Messrs. Emerson and Sparrow) appeared for the prosecution; and Mr. Linay defended. – Detective Wigley having given evidence as to himself and Detective Mason apprehending the prisoner in the act of taking away the flour, Mr. Julian Wells was called and deposed to the prisoner not having any right to take the property away. – Prisoner now pleaded guilty, and Mr. Wells having recommended him to mercy at the solicitation of Mr. Linay, he was sentenced to only two months’ hard labour. Wells Brothers were listed in Hamilton’s Directory of 1879 as millers at New Mills and the towermill at Crook’s_Place. John Robert Wells, born c.1835 and Frederick Rising Wells, born c.1850 were both sons of William Harrinson Wells and were born while the family were living in Dilham. In 1881, Frederick Rising Wells was given as a miller and corn merchant living at 5, Heigham Road, Heigham with his wife Ellen R., (31), son Frederick G. R. (8) and daughter Lillian (7). 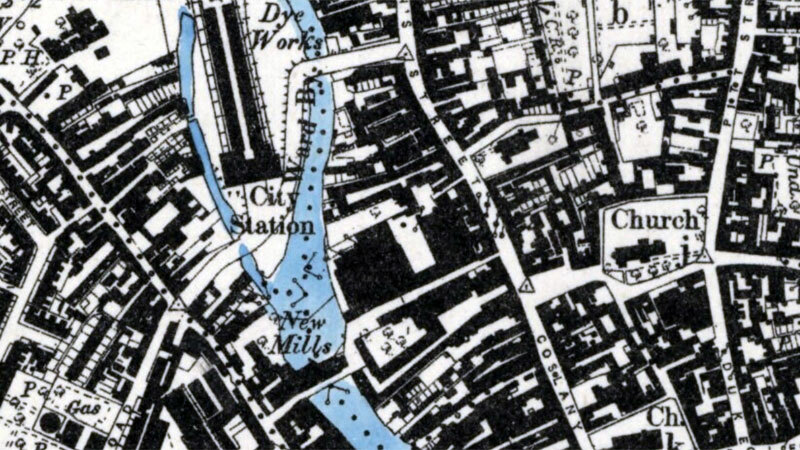 Wells Brothers were listed in Eyre’s Directory of 1883 as millers in Essex Street and New Mills Yard. The Wells Brothers' partnership was dissolved on December 1884. Wells Brothers were listed in Hamilton’s Directory of 1879 as millers at New Mills and the Tower Mill, Crook’s Place. John Robert Wells, born c.1835 and Frederick Rising Wells, born c.1850 were both sons of William Harrinson Wells and were born while the family were living in Dilham. In 1881, Frederick Rising Wells was given as a miller and corn merchant living at 5, Heigham Road, Heigham with his wife Ellen R., (31), son Frederick G. R. (8) and daughter Lillian (7). 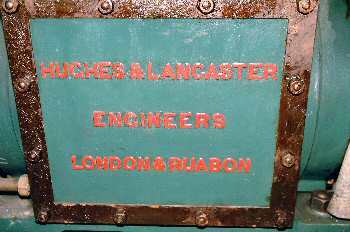 Wells Brothers were listed in Eyre’s Directory of 1883 as millers in Essex Street and New Mills Yard. 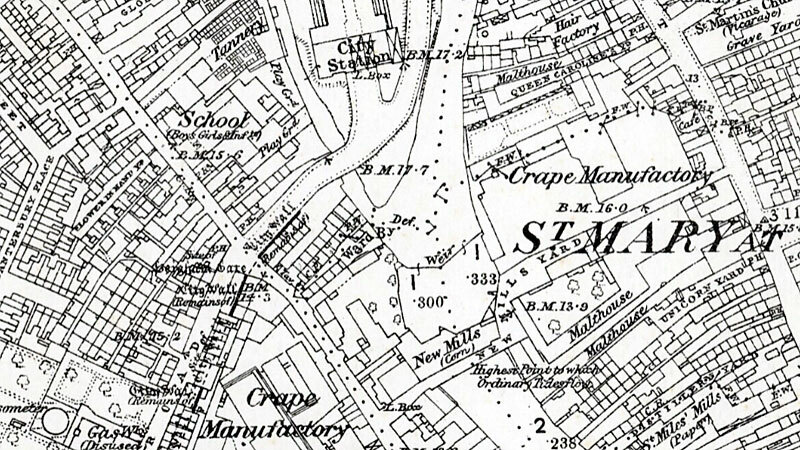 The towermill was marked on the 1884 map. The Wells Brothers' partnership was dissolved on December 1884. Wells Brothers were listed in White’s Directory of 1887 as corn merchants and millers, New Mills Bridge and Crook’s Place mills. 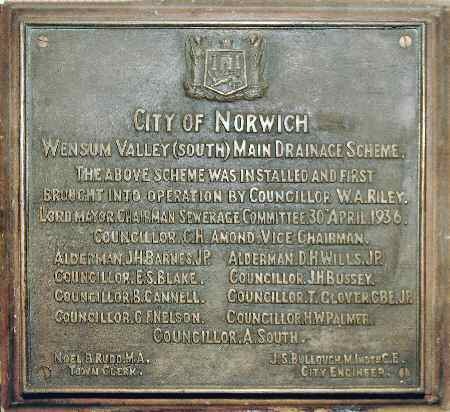 The brothers were individually listed as follows: - Frederick Wells, home Heigham Road; John Wells, home New Mills, Lower Westwick Street; John Robert Wells, home South Heigham; Julian Wells, home New Mills, Lower Westwick Street. Julian Trivanion Wells was born c.1840 in Dilham, Norfolk and in 1881 was given as living in Lower Westwick Street, St. Swithin with his brother Raymond A. Wells. 19th August 1698: Richard Soames & George Sorocold leased New Mills for 8 years. Soames had previously taken over Barry's interests in the water project. 1731: Mortgaged to James Pitt for securing an Annuity of £50 from lady (day) 1732 for his life. 1793: White and Crane granted a 99 year lease for the mill and water supply - given 5 years to rebuild water system to spec. Pigot's 1839: Crane & Co.
October 1872: Potter Batson, one of William Harrison Wells' employees was caught stealing flour. He was sentenced to two months Hard Labour. Post Office Directory 1875: Wells Bros.
1959: 5 air compressors - 3 electric and 2 water turbines producing 100b.h.p.